SBEP Bay Partners grant program accepting applications for 2016-17! Up to $3,000 in grant funding is available per applicant for projects that focus on Bay Habitat Improvement, Bay Water Quality Improvement, and/or Bay Related Environmental Education! DEADLINE TO APPLY: MARCH 2, 2016. 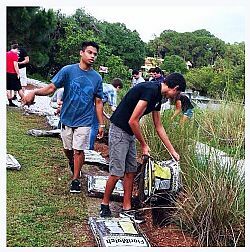 Businesses, non-profit organizations, schools, academic institutions, civic associations, religious organizations, and neighborhood/homeowners associations located in Sarasota and Manatee counties with projects that will benefit the Sarasota Bay watershed are eligible. The Sarasota Bay Estuary Program is dedicated to restoring the area's greatest natural asset - Sarasota Bay. The SBEP offers special thanks to its partners: Sarasota County, Manatee County, City of Sarasota, City of Bradenton, Town of Longboat Key, U.S. Environmental Protection Agency, Florida Department of Environmental Protection and Southwest Florida Water Management District.